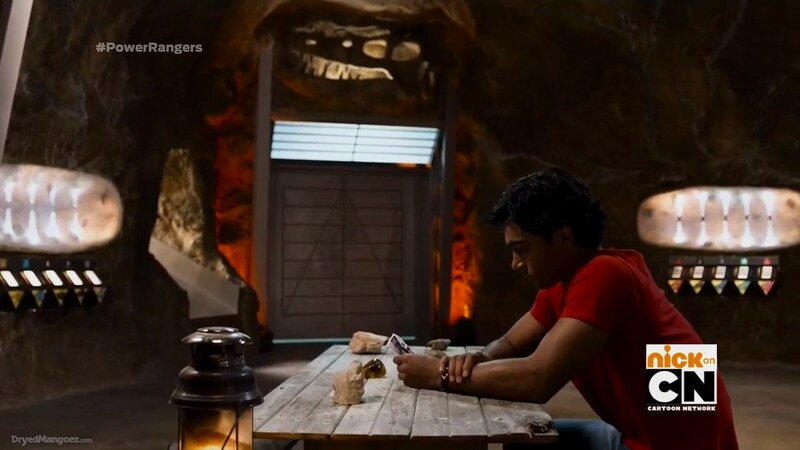 Recap: Power Rangers Dino Charge, Episode 10 – "I can feel the charge of strength!" Kendall has been working all night on a new battle mode for the Megazords, Dino Drive, to help fight Fury. Shelby tries to convince Kendall to allow her friend Julian to display his sketches at the dinosaur museum, but she turns him down. Shelby expresses her frustration to the guys who are unloading the crates of artifacts for the new Treasures of Zandar exhibit which includes the Stone of Zandar. Riley explains that according to legend Sir Ivan, a knight, found the stone while he was escorting the Prince of Zandar. 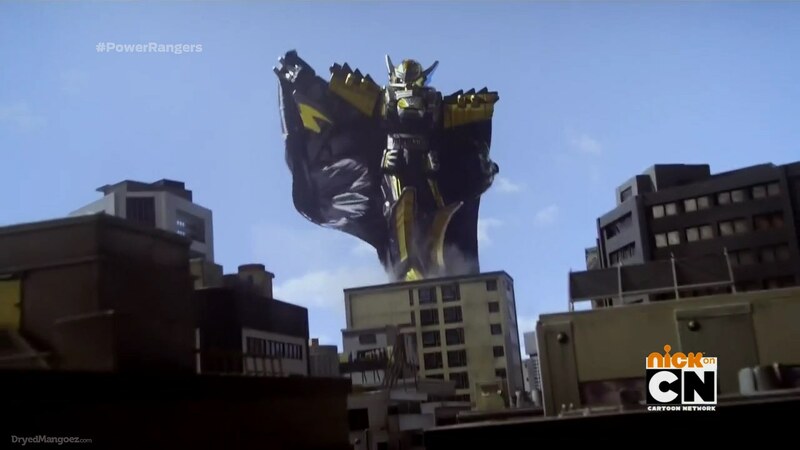 But Riley’s story is interrupted when the Ptera Zord appears and starts attacking the city. Koda and Chase summon Stego Zord and Para Zord to try and get Pterazord under control. But the Pterazord suddenly morphs into the Ptera Charge Megazord with Fury at the controls. 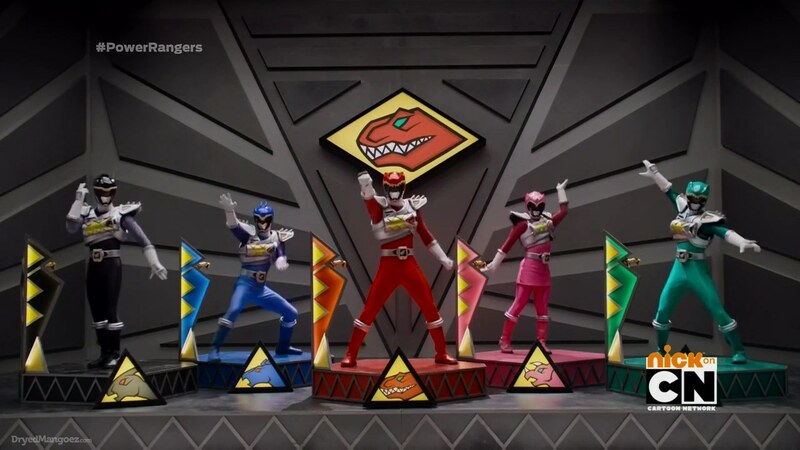 Tyler summons T-Rex Zord and the Rangers hop into the Para Stego Formation of the Megazord. Having earlier said the Dino Drive mode is still untested and dangerous, Kendall tells Tyler they must use it anyway. They initiate Dino Drive and it works fine. After fighting for a while, Fury retreats when the Ptera Charger runs out of power. 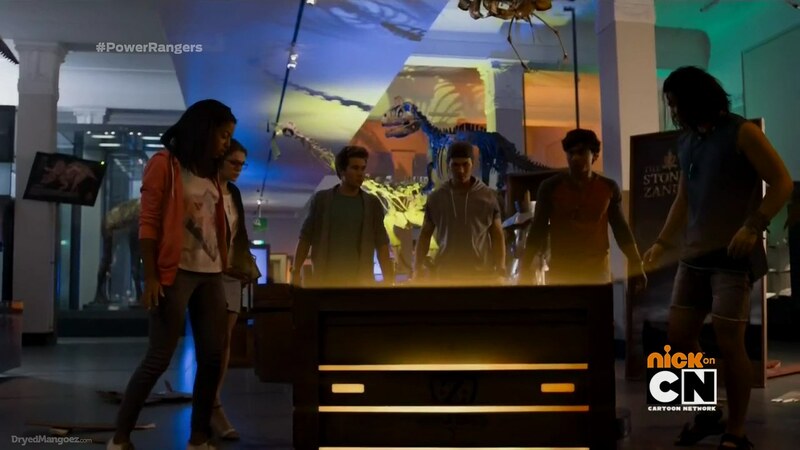 Later that night, the Rangers and Kendall are unpacking the Zandar exhibit while trying to figure out why Fury’s Ptera Charger lost power so quickly. After Shelby mocks the princess tiara, the Rangers all work to lift the crate with the Stone of Zandar in it. It suddenly begins to glow and react with their Energems before it bursts open. The Stone of Zandar is the Gold Energem! Kendall confirms its authenticity and Keeper is excited to have his friend back. They want to figure out a way to keep the Energem from Fury, but Tyler has a better idea. Up on the ship, Wrench tries to recharge the Charger using Fury’s energy again, but the golden blob appears to be blocking the energy transfer. Fury takes the half-charged Charger. He heads to the bridge and sees Poisandra and Curio are watching some gossip show Glitz World. He orders everyone to get back to work. But on the gossip show is a story about the Prince and Princess of Zandar appearing at the museum tomorrow to launch the exhibit. And the Princess will be wearing the Stone aka Energem. Turns out this is all the Rangers’ plan. Shelby, however, is not too keen on wearing her pretty, tight pink dress and high heels. 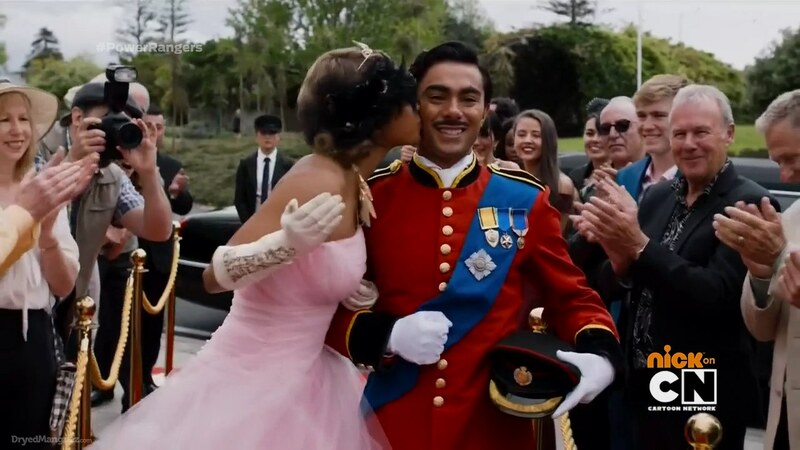 Kendall decides to do it instead, but Shelby changes her tune when she sees Tyler looking very dashing in a royal outfit. Keeper says a Princess doesn’t always have to be spoiled and she can use her position to do good if she chooses. Next day, Riley poses as security, Chase as a paparazzi, Koda’s just up a tree and Kendall is the driver of the limo Tyler and Shelby gracefully step out of. The crowd and the press excitedly take pictures of them. A paparazzi asks for them to kiss and Shelby quickly obliges. Shelby spots Julian sketching in the crowd and hurries over, proclaiming that she must have one of his drawings. The Prince and Princess end up taking two and the press converge on this royally-approved artist. With Fury still not in sight, Tyler gets to the podium and begins telling the story of the Stone of Zandar. That’s when Fury finally bursts through to grab the Energem from Shelby’s neck. Fury summons the Ptera Zord, but when he uses the Energem, he finds that it is a fake. Fury is ejected from the Ptera Zord and is joined by two Spike Balls (?). The Rangers go to him. They morph and fight the just arrived Vivix. Chase hands Tyler his Para Chopper who combines it with his T-Rex Smasher to create the T-Rex Chopper and use against Fury. Tyler demands Fury hand over the Ptera Charger or he dies. But the golden blob suddenly starts emerging from Fury’s body once again. Tyler demorphs and can’t bring himself to finish Fury off now in this struggling state. Fury represses the blob and the Spike Balls whisk him back up to the ship. Back at the museum, Julian happily tells Shelby the news that his work will be displayed in New York and London. Shelby says Keeper was right about a Princess being more than just a tiara. Down in the command cave, Kendall finds Tyler who is looking at a photo of him and his father. She asks why he didn’t finish off Fury and regain the Ptera Charger. The others say Tyler made the right decision. Tyler explains to Kendall that the spirit blob inside of Fury might be his father after being captured 10 years ago. Keeper says it is never a mistake to follow your heart. Until they free whoever is inside Fury, he cannot be killed. I thought this was a much more enjoyable episode than last week’s, though still with some things to pick at. The first part including the megazord battle felt a little odd and too busy. Needing a zord battle in every episode, I guess it fit better at the beginning than at the end considering the plot that we got. But I think the Rangers just standing around and sending their zords after Fury felt awkward. Then there was all that stuff with Shelby trying to get her friend’s sketches displayed at a dinosaur museum. A DINOSAUR museum! He wasn’t even drawing dinosaurs? That was weird. And it was supposed to help prop up the subplot (treated as the main plot?!) of Shelby not wanting to be a pretty pretty princess. Really though, at the end, it seemed like this episode was supposed to be a Shelby focus with the lesson being “Don’t judge a Princess by her tiara.” Umm… huh? Dino Drive’s introduction also felt uneventful. 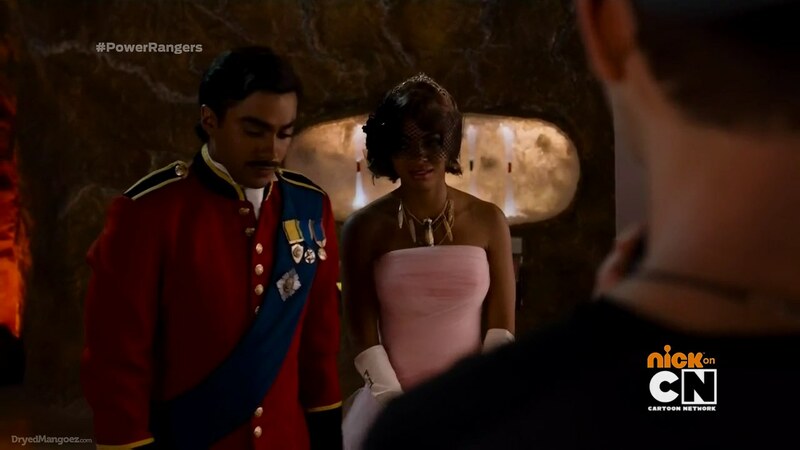 The best part of the episode though was them dressing up and putting on that whole charade. The whole thing was pretty over-the-top and elaborate, maybe even a little illogical [/Puzzler from last week]. But at least it was fun. And it at least played up the Tyler-Shelby romance angle. So overall, it was a better episode than Episode 9 and it was enjoyable, but still missing some good cohesion. 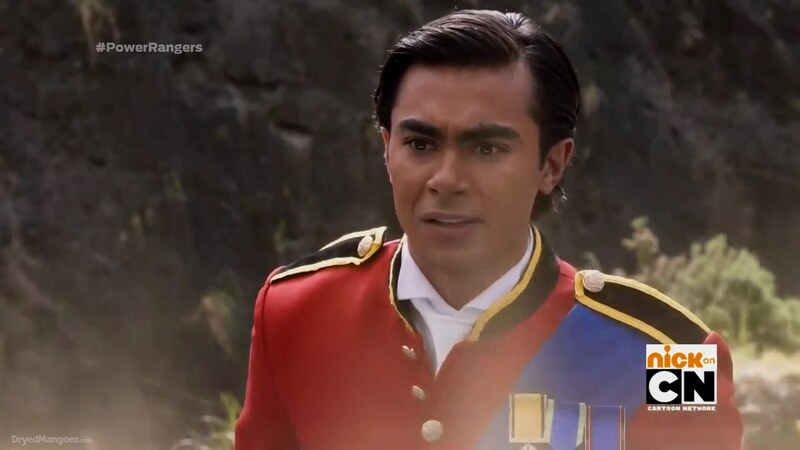 Another week of the Dino Charge episode being completely different from its Kyoryuger counterpart. Very minimal recycled footage and a completely different plot. Kyoryuger‘s episode revealed the identity of KyoryuGold and it included Torin basically explaining and introducing him before hand. This was, if I remember correctly, the first plot-driven episode of the season. It was mostly about random insanity and character set-up before this. 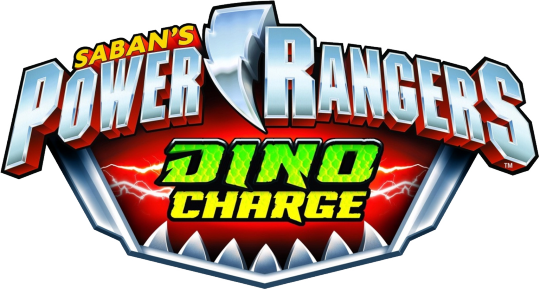 Lots of NZ footage on Dino Charge as well, so that’s great to see. I didn’t expect you post so quickly! This was an excellent episode. 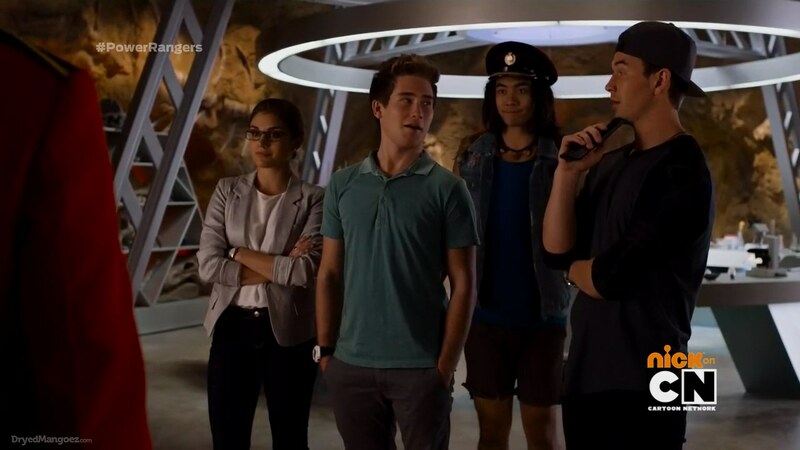 The humor and action was well-balanced, and the enigma about the thing inside Fury will sure keep us in suspense untill next episode, where I think the Gold Ranger will finally make his debut! Yeah it was definitely enjoyable and a lot of fun. I thought this was definitely a step up from last week’s episode! I enjoyed it! It made sense that Tyler didn’t finish Fury when he had the chance. Because if he did, that would eliminate the only connection he has to his dad. Heck, that blob trying to escape Fury could be him. Or the Gold Ranger. Either way, I like that they acknowledged that unless whatever (or whoever) is trapped inside Fury is freed, Fury can’t be destroyed. Can you imagine if, let’s say, Sledge attempts to destroy Fury for his incompetence and Tyler has to save Fury? I could see that happening. What about you? As for whoever is inside Fury, who do you think it is? Tyler’s dad or the Gold Ranger? For me, it’s a coin toss as to who it is. It could be anybody (or maybe neither????). But I trust that Chip knows what he’s doing and I will wait to find out. I think they might hold on the reveal of Tyler’s dad until maybe the midseason finale or something. I hope it will be a good reveal. I think the blob will be the Gold Ranger. Sorry for being late. I had a busy week. 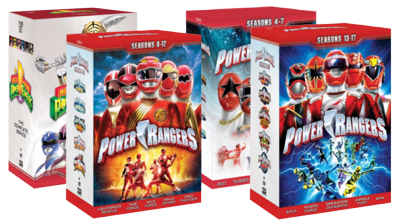 It’s hard to believe that we’re half-way of the season; quarter of the entire series (including Dino Supercharge, 10/40). Time sure flies fast, eh? Still very frustrated that France gets to finish this week, while U.S. has to wait 2 FRIGGIN MONTHS to finish (and being last). It’s just aggravates me. I should be used to this by now… so whatever. Damn it. I started with another rant. Regardless, to make up those frustrations, this episode pretty much makes up for it. It was much better than last week, so it helps a lot. I really like the design of Dino Drive mode. While I didn’t think Samurai Mega Mode was bad, it was bit bulky and awkward; this suit on other-hand, is very simplistic matches their suit very well; even though, I’m not a huge fan of design. It’s nice that EVERYONE get to have their own power-ups, even if it’s for cockpit. Still better design than that god-awful horrendously ugly-as-hell red-only, “Carnival” Mode (take that Sanjo!). I realize in Saban Brands Era, the cockpit that you sit (Megaforce/Super Megaforce) doesn’t require armor/power-ups, and cockpit that require standing does; yes, I’m aware it’s sentai/original footage difference. I guess armor/power-up allows you to protect, if you fall or something; but I digress. Speaking of cockpit, it’s nice that Pterazord also has cockpit similar to Dino Charge megazord (no surprise). It’s nice to see Fury in original cockpit footage. It’s been a while since we had villain in megazord, with original footage. I also nice that they used “black” for background wall, showing evilness. It makes me wonder, if the color of wall would change color, once Gold takes over. 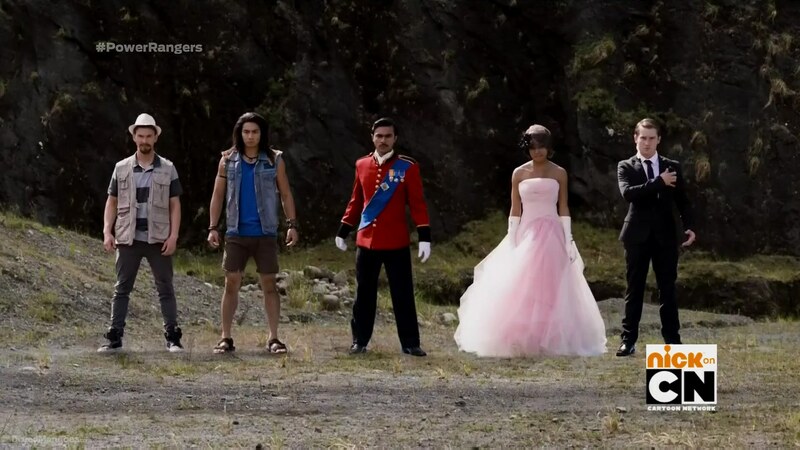 It’s nice to see backstory of Sir Ivan, who would later become Gold Ranger. IMO, his backstory was far interesting handled better than Utsusemimaru (Take that Sanjo!! This is how you make origin story and develop character!!!). It’s also nice that they used serntai term “Zandar”, which was a name of Gold Ranger’s weapon, Zandar Thunder. Tyler and Shelby did great job as prince and princess. They sure make a great couple! Probably one of the best moments of the season IMO. Rest of the rangers (minus Koda), does a great job with disguise as well; Chase as press (nice beard), Riley as security (nice glasses), and Kendall as limo driver (nice hat). It’s been a while we’ve seen rangers-in-disguise plan, that was handled very well. I like how Tyler thinks “gold energy” of Fury, is his dad; even though, we’ll soon finds out who’s the real identity later. It’s really interesting how he speculate that Fury kidnapped his father 10 years ago. Keeper advice at the end was very nice way to wrap the episode. Here’s a few glaring weakness from this episode. Is it me, or have Poisandra and Curio has become very useless and annoying in last few episodes? They haven’t done much in Gold Energem arc. Curio hasn’t done anything significant at all; he’s just dicking around in background, babbling occasionally. I also didn’t like Julian’s subplot very much. It wasn’t terrible, but it felt so random and out-of-place in this story arc; it was just an excuse to give Shelby more screen-time and development. If this was done earlier, then it would’ve worked better IMO. 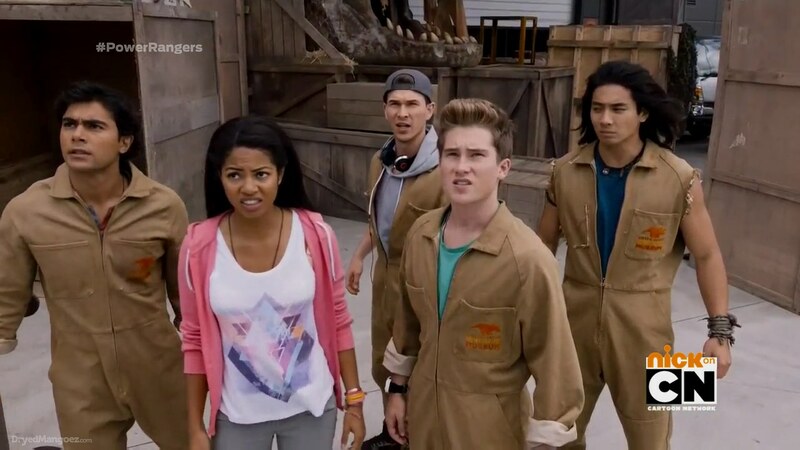 I may be minority, but Jordan from Megaforce was handled slightly better IMO; at least that was done earlier in the season. Overall, this was a very fun episode! Not only it was much better than last week, but it may be my top favorite of the season. I wished this episode aired, before the hiatus IMO. I hope we get more of Ivan’s backstory too even after he debuts. And I also hope they really develop the story of Tyler’s dad very well too.